Alessi Citrus Juicer by Eero Aarnio. We are glad to see some new creations by Space Age designer Eero Aarnio for Alessi. One of them is the citrus-squeezer "Citrus", in thermoplastic resin. 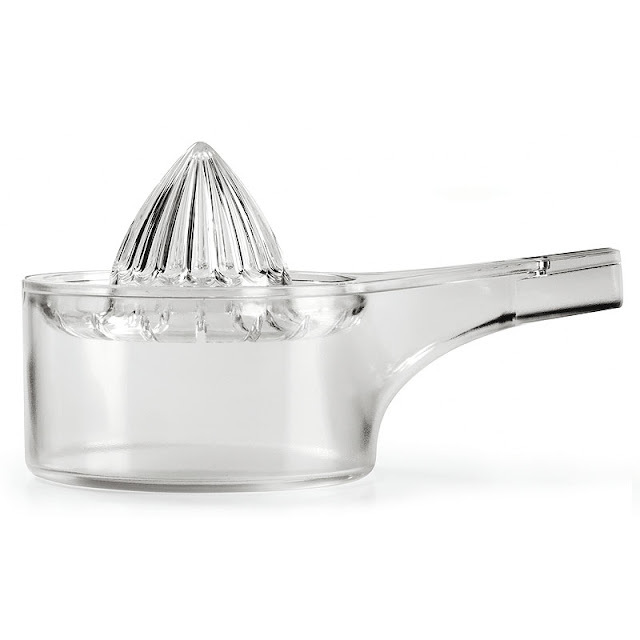 This beautiful citrus squeezer is the perfect modern kitchen accessory. For over half a century, and with great consistency, the Finnish designer Eero Aarnio has designed brightly colored objects for the house with rounded, geometric shapes that allude to a kind of space age design code. His works, almost all made in plastic, are short, visual tales that combine features both humorous and playful with precise and explicit functional meanings. Eero Aarnio is known for such iconic designs as his "Ball Chair" (1966), "Pastil Chair" (1967) and "Bubble Chair" (1968). Finland's Eero Aarnio (1932) is one of the leading innovators in contemporary Scandinavian design. He interests me because I see in him a sort of childlike elder, an eternal boy, always ready to grasp the playful and paradoxical aspects of the design world. In short, a sort of "Scandinavian ludicism" far from the austere professionalism prevalent in Northern Europe design. The projects we're presenting today are the first in a series of objects that is destined to be expanded. (Alberto Alessi).